How often have you heard this statement thrown around, whether you are purchasing goods, held up in roadworks or considering if you should commit to an activity? A person’s perceived passing of time can be an individual as they are. What happens when it is stated that the time to do a task ‘will only be a minute’, yet takes more time? Would this create irritability for a customer? The provider of the time frame may be trying to imply that it is a very short period that one needs to wait. 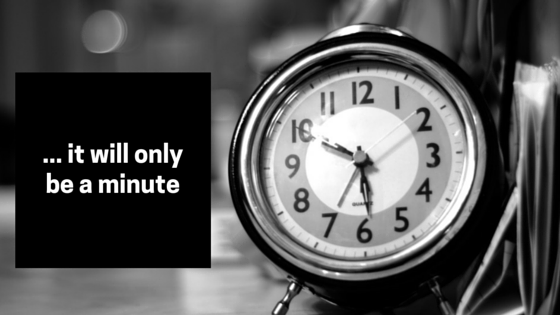 Therefore, saying ‘only a minute’ is sufficient indication of the time required to wait. While the receiver of this information anticipated the wait time as literally ‘one minute’, and the task takes longer, it is very confusing and creates a sense of anxiousness and dissatisfaction while waiting. Science has supported the perceived passing of time, and the increased irritability of fellow humans. David Maister puts it far more eloquently in his article The Psychology of Waiting Lines. This leads me to think about the Under Promise and Over Deliver (UPOD) methodology. It seem to go to the heart of statements like ‘it will only take a minute’ when it is most likely that it will take longer. There are time when it seems that the method is applied back to front, Over Promise and Under Deliver. The UPOD experience, for any customer, utilising any business, should result in an outcome, equal to or better than, what has been promised. Unfortunately, promising the correct timing is not simple. Very considered thought is needed before any promise is made. Business needs to retain self-control of reactive statements like ‘it will only be a minute’ or ‘take a seat, it won’t take long’, to ensure that a UPOD experience is received by customers. Understanding a customer’s time requirements can assist in reducing irritability when waiting. How do you feel when you have to wait without knowing how long your wait will be? Maybe think about that next time you instinctively say ‘in a minute’.